Various options are available. Contact us for JETI Spectraval accessories, diffusors and filters. US orders ship USPS Priority Mail and international orders ship USPS Express Mail. International orders may include extra import duties and/or taxes according to the laws of the target country. Contact us for custom shipping. to your local currency. Given the nature of calibration software/hardware, all sales are final. Orders ship directly from our ChromaPure partner in Missouri, USA. We've worked out an exclusive deal for our members to bring you this product at a price lower than what everyone else pays anywhere on the internet. Buy direct from our ChromaPure partner at prices lower than buying off their own website. Same product, same support, just more money in your pocket at the end of the day. Confused about meters? See our FAQ: Which meter is right for me? 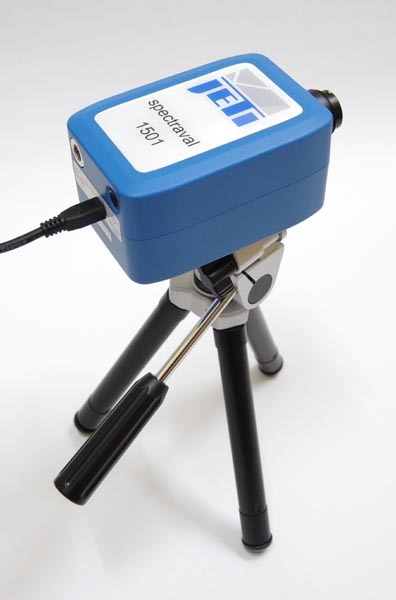 The JETI Spectraval 1501/1511 spectroradiometers are the most affordable true reference device available. The Spectraval 1511 is less expensive than the JETI 1211 with similar performance and significantly enhanced user flexibility. Just mount either on a tripod, facing towards the source, connect to ChromaPure Professional and use as you would any other color analyzer. 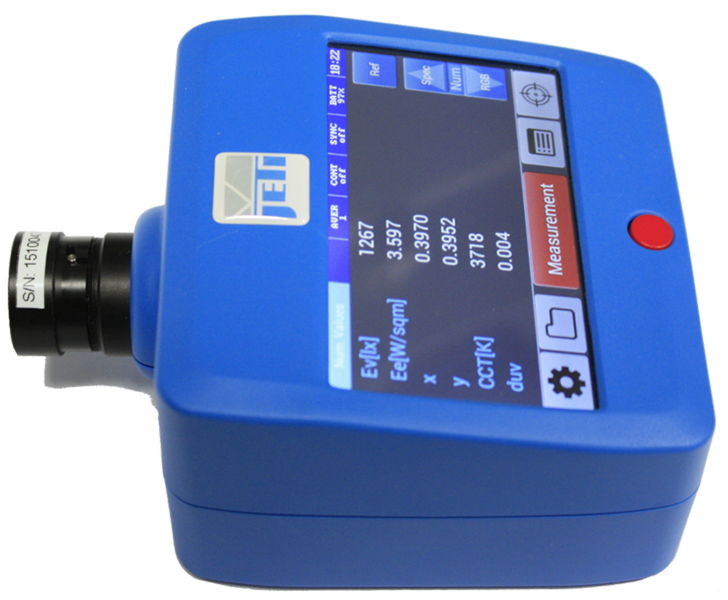 Coming off the enormous success of the JETI 1211, JETI has developed a new line of reference spectroradiometers that seek to offer equivalent performance to the 1211 at an even lower cost and with increased user flexibility. This effort has resulted in two new products, the Spectraval 1501 and Spectraval 1511. Each performs the same, but offer different user interfaces. The 1501 must be controlled by PC software, just like the JETI 1211. The 1511 adds a small LCD screen that allows the user to take measurements and view results without ever connecting to a PC. However, at some point in the display measurement process you will probably want to connect to video calibration software for analysis and reporting, which is why we offer the Spectraval 1511 bundled with ChromaPure Professional. Both the 1501 and 1511 offer built-in Bluetooth, which allows wireless connection to the PC for added user flexibility. Otherwise, the Spectraval units offer similar speed, accuracy, and repeatability to the 1211 in addition to offering even higher dynamic range through greater maximum luminance. The 1211 offers a wider spectral range, but this is unnecesary for measurements in the visible range that we care about in home theater. To top it off, the Spectraval units are less expensive than the 1211. Why buy a JETI Spectraval 15x1 instead of a JETI Specbos 12x1? The JETI Spectraval 1501 is the replacement of Specbos 1201. It covers the same spectral range (VIS), but is about ten times more sensitive. Therefore it can be used for low light applications in the same manner as specbos 1211, where specbos 1201 was not recommended for such as the calibration of monitors. Spectraval 1501 is intended for Radiance mode measurements only, a diffusor, which is included in the specbos 1201 delivery, has to be ordered separately (ACC 032). If a stand alone solution is needed, then spectraval 1511 can be used. It has the identical parameters as spectraval 1501, but is equipped with display and SD card reader. For a more in-depth comparison, refer to the JETI 12x1 vs 15x1 document (PDF format). For best accuracy, we recommend calibrating front projectors by taking readings directly off the screen. Our JETI Specraval kits include a tripod. For your convenience our ChromaPure partner offers a simple calibration DVD that includes all of the test patterns that you'll need to perform a complete calibration of your display. This DVD is offered free as a complementary download. Download the .zip file to your PC. Unzip the contents, which is an .iso DVD image file, to your hard drive. If you have DVD burning software (e.g., Nero Burning ROM), the file will open. Set the image type to DVD (not CD) if necessary. Insert a blank, writable DVD into your DVD burner, and then burn the image. 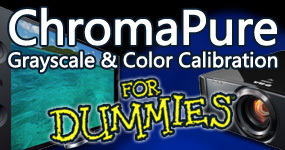 For reviews/testimonials of ChromaPure calibration software & packages, see our ChromaPure order page. CurtPalme.com are calibration experts and authors of the popular free calibration guide: Grayscale & Color Calibration for Dummies. We live and breathe calibration. No matter what your needs we can assist in choosing what's right for you. We offer products for the budget DIY'er all the way up to the seasoned professional, all at CurtPalme.com discounted prices. FAQ: Which meter is right for me? When purchasing you will be paying and dealing directly with the third party seller 'Display Calibrations LLC'.